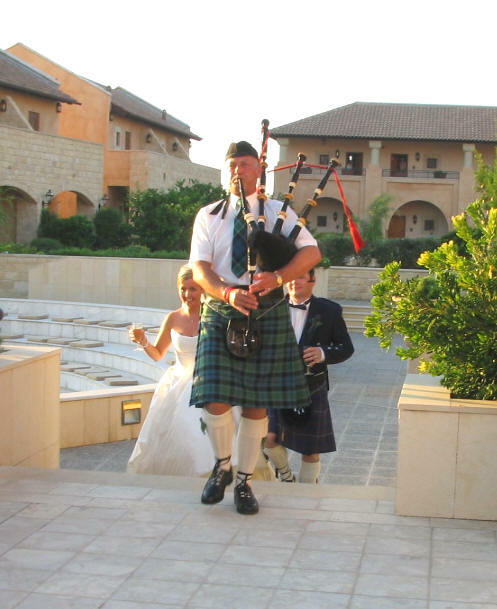 Cyprus wedding arrangements from wedding reception catering to music and honeymoon. When making arrangements for your wedding we will keep you informed - Yes we do tell you exactly when the wedding is, as well as your pre nuptial appointment - we check all the paperwork in advance, to make sure it is all in order BEFORE you arrive. If you need special paperwork because of your nationality or circumstances, we arrange it. One of the reasons we got into this business was because of the terrible way the big tour operators seem to deal with peoples wedding day - not even telling them the time of the ceremony - how is one to arrange a reception, car, photographer or any other peripheral services if you don't know the full details. We are happy to arrange any part of your big day - we do not hold you to ransom, we will cooperate with anyone you like to help make this wedding the best day it can be. 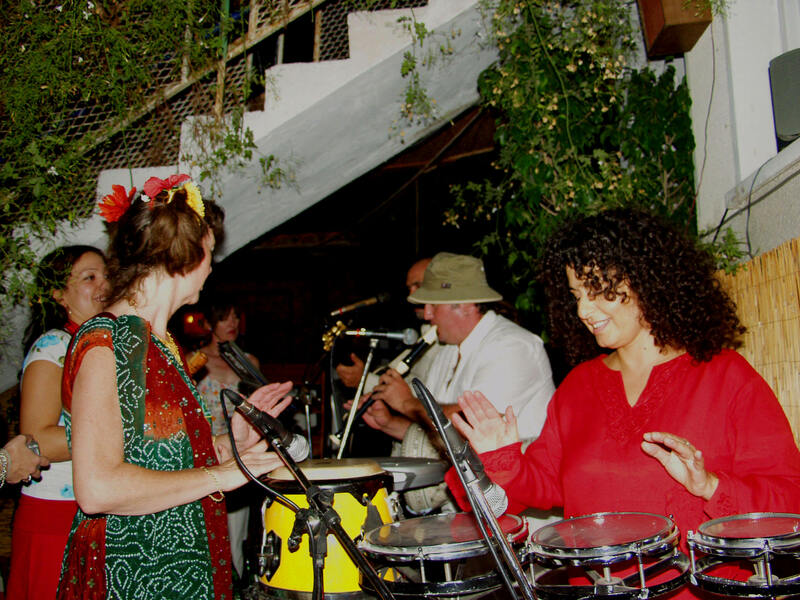 Wedding and wedding reception Music - We wouldn't dream of telling you what to have, you must have what you like. Do you like any particular kind? Do you want live or pre recorded? If you are getting married on the beach, in a hotel or villa or another private venue you may be as way out as you feel or as traditional as you like. We have musicians ranging from pianists, violinist, (hear below) bagpipes, (hear below) jazz band, Rock & Roll...well I could go on, but as I say, it is up to you. Discuss it with your partner, friends, family, anyone who shows an interest to bounce ideas off. 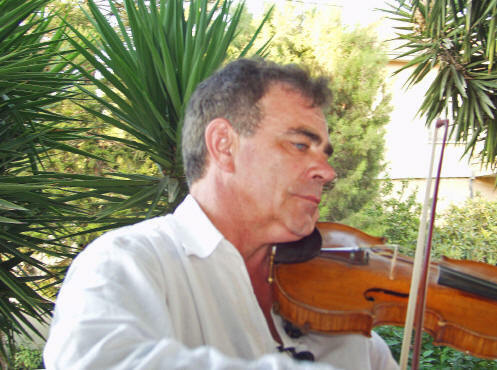 More Music - We have a wonderful Hungarian Violinist - Romance up the isle on the island of love (no we are not corny !) who can play your favourite rhapsody. He is a world class violinist and we have prepared a clip so you can hear the quality and tone of his playing. He plays also in a duet with a piano - a rich and full sound suitable for the perfect reception. A palm court quartet can also be commissioned. See the feedback we have for rave reviews. (great fun where those who wish can join in ) followed by a rock band or DJ. It's up to you, let us know, and if you can afford it, yes you can have Sting or the Stones! If you want an out of the box ready made simple or fairytale wedding, please check our special Cyprus wedding packages or one of our slightly off the wall alternative Cyprus weddings..
Entertainment - after the event itself - we can provide you with a fun casino for the evening, an Elvis look alike, Frank Sinatra or something a little more up to date - there are many acts available in Cyprus. Ask for the options. Wedding Rings - A pair of Gold or rings, inscribed with your names and the date. Classic simplicity or something more in keeping with your style? Recently we had a pair of interlocking wedding rings made of Platinum, they fit together and are beautiful when apart as well. Let us have your ideas and we will get you a quote from our bespoke jewellers, their work is excellent as well as nicely priced. Bridal Gown Hire- Choose from a selection according to size. Or have one made to hand down to the next generation! We cooperate with wedding hire professionals to either make your outfit or hire you one for the day. Yes we do stock kilts for the men as well as dinner dress and other formal wear. Wedding Videos & Cyprus wedding Photos - Photographs can be presented in a keepsake Album, with the original proofs (so that you can get as many printed as you want) this is now an expensive option in the world of digital photo's, which we do too. or choose a package with a pre specified number of photos, perhaps you prefer them on a page in the web or we can upload them to your favourite new fangled app thingy. Wedding Cake - Single or tiered traditional wedding cakes, or pick a theme. Prices vary as does style, taste and quality. A wedding cake in Cyprus is not necessarily a traditional fruit cake covered with marzipan and royal icing, so if that is what you want, make sure before you order what the style will be, we will ask, many will not and you will get a chocolate biscuit covered in icing. A truly traditional tiered wedding cake with white icing? Dark and white chocolate mudcakes with white ganache. 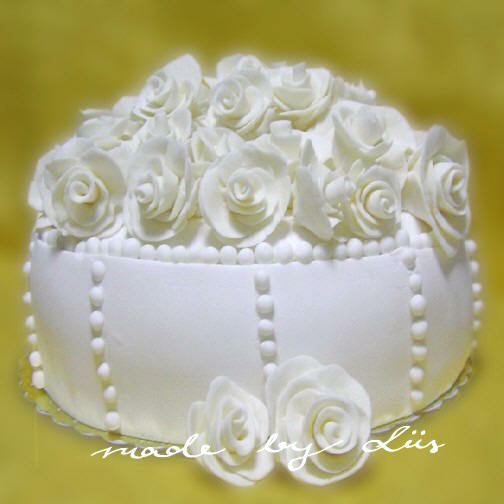 Covered with vanilla fondant and 150 handmade gumpaste roses, or a traditional fruit cake with fondant icing. See some of the creative possibilities for wedding cakes..
What's the venue? We have some great caterers who will serve you a BBQ on the beach, a veritable feast in a villa or even bring in the caterers to help a small intimate restaurant that you like, to feed more than they are normally set up to cater for. do you need Kosher or Halal catering? Vegan or vegetarian? spicy or gluten sensitive. All dietary tastes are catered for. We have a delightful Cyprus wedding bar mobile cocktail show which can service any amount of guests, some great packages which make it the most cost effective and charming way to provide refreshments to your guests, both alcoholic and teetotal. We can organise a wedding banquet that your guests will remember and every wedding they ever attend after yours will be compared. " Do you remember the wedding in Cyprus? Now that was a wedding feast like we have never seen before or since !" Wedding Flowers - A traditional touch. From a petite posy to towering Wedding flower arrangements. We make buttonholes, corsages, brides and bridesmaids posies, decorate the wedding and reception venue with beautiful flowers - we can even provide material garlands, flowered archways and put down the red carpet. Pamper yourself with a full morning of makeup, nails and hair - or take a relaxing massage first. If you are having your hair done on the day, we include a pre wedding trial run - just to be sure. Doves - We can arrange for a pair (or more) of white doves to be released by the bride and groom, any members of the wedding party or our coordinator. Wedding Flower Orders - Don't know what to get the happy couple? We have some gift ideas as well as flowers and booze, but so do they. If you are unsure it is cool to ask them. We also know suitable shops with large stock, reasonably priced for gift ideas. Honeymoon Cruise 2, 3 or more days. Reception and Honeymoon on a private yacht perhaps. a week of decadence. We have plenty of ideas if you let us know a bit about yourselves, as your taste is what matters. Cyprus, Chyphre, Cypress, Cipro or Chypre. All known as Aphrodite's birthplace, the goddess of love. Cyprus wedding arrangements - we can arrange the smallest detail to the biggest bash - Cyprus wedding arranges what you need and more to make your wedding in Cyprus a great occasion.